Young Gustavo wants to become a champion “luchador” or Mexican wrestler. The only problem is that he’s only 4 feet tall and weighs something like 80 pounds, well below the lightweight category and enough for anyone to send him flying across the ring, if not right among the crowd. In Gustavo El Luchador by PearFiction, you get the help our young (and tiny) hero reach the top of the Mexican Wrestling standings, and wrest the prized golden belt held by El Titan De La Muerte, the unbeatable champion. You’ll be forgiven for thinking Gustavo’s got a gigantic task in front of him, especially if you consider his wiry body, but hey – nothing’s impossible! In this five-reel, twenty payline slot by PearFiction you will be able to follow Gustavo on his way up to competition ladder, helped by bonus modes and, why not, a bit of humour too. And now, let’s take to the ring to follow Gustavo’s quest! Gustavo El Luchador is played on five reels, three rows, and comes with 20 fixed paylines. The game has an RTP of 96.01% and can be played from a minimum of € 0.2 up to a maximum of € 20. The game is classified as a medium-high volatility slot. The most attractive bonus game is the Rumble in the Ring bonus, where you help Gustavo fight a variety of wrestlers in four Free Spin rounds which will boost your winnings and give you a decent shot at taking the golden belt off El Titan De La Muerte (no translation needed). Spin the reels and if you land matching wrestling move symbols you will inflict damage to your opponent. Defeating the other Luchadores will take you to the next round against a new opponent. Beware, however, that the opponent’s wrestling moves may also damage you, and you might end up face down on the ring. And that’s not how we want it to end. The Fist, Elbow and Boot symbols can create an attack on your opponent (with just two symbols), but the Signature Moves will definitely inflict more damage. You will need three Free Spins symbols to trigger the Rumble in the Ring Challenge, and these land on reels 1, 3 and 5. In the Free Spins mode there’s a total of 81 ways to win, from left to right and right to left, and the mode will last until Gustavo is defeated. The total win multiplier at the end of the mode is equal to the number of opponents you have defeated. The Las Mascaras bonus is a pick me bonus offering three tiers of prizes. Pick from the masks and dolls in front of you to either win instant cash prizes, or else upgrade the value of the prizes hidden behind the masks and dolls! To trigger the Las Mascaras bonus mode, you have to land three or more Bonus symbols on any of the reels. There are two paytables in Gustavo El Luchador. In the base game paytable, you will see that the Luchadores symbols pay the highest amounts, and from lowest to highest these are Los Tigres, Infierno, Tarantula, El Titan and Gustavo himself. The lower paying symbols are the taco, the bell, the cactus, the chilli pepper and the tequila bottle. In the Free Spins mode, the values of the low-paying symbols are different, while the high paying symbols are the silver trophy and the golden belt itself. PearFiction brings a ton of humour to this video slot, with cartoonish graphics and a generally light atmosphere that makes for very entertaining gameplay. You’ll make no mistake, this is Mexico and the temperatures seem to be sky high, with the reels set against the square of a little town in Mexico. The controls are easy to trigger from the left hand side of the screen, from where you can also change your bet amounts and have a look at the paytable. 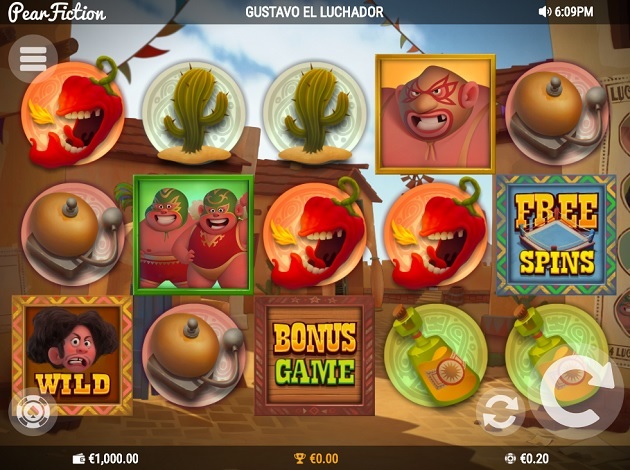 Gustavo El Luchador is a fantastic video slot from PearFiction, with a great selection of extra features, humour, colourful cartoon graphics and plenty of fun. Will you be the one to take Gustavo to the top of the heap? Maybe you won’t need to train with him in the ring (who wants to be the sparring partner of a Mexican wrestler?) but with a few spins you might be able to coach him to victory from the comfort of your sofa. With a smooth brand name and an impressive business, PearFiction is quickly making its way to the top of the industry. Their games revolve around the concept of humour and fun, and this light atmosphere is reflected in the way they run their offices and also in the work they end up providing to their operating partners. PearFiction Studios is a fairly new company, launched relatively recently in 2014, with the general mission to start creating casual and easy-going mobile games for iOS and Androids. They started with the launch of a dozen games and managed to entertain a whopping 5 million players during the first two years in operation – so as you can see, it’s been a quick rise to the top for them. The online casino games are slightly fewer than their collection of mobile games, but only for now. Right now, you can find 3 games in the Video Slot portfolio, with more coming up shortly. Gustavo El Luchador was officially released in 2018 and it’s the first of what will hopefully be a long series you will find on Videoslots.com.